It's officially the beginning of The Season here in South Florida; the natives know exactly what that means, and they say it with those capital letters. The yearly migration is in full swing as "snowbirds" flee the winter and try to find a corner of beach to warm their bones. And with The Season, it's not by coincidence that we start a new season of theatre. It starts south, in Miami, where there's a solid permanent population, and creeps its way through Broward and on up to Palm Beach, where the population seems to double between September and November. And what a start it is! Three shows opened, two in Coral Gables, and one in Fort Lauderdale. We have 9-1/2 reviews* from six different sources. And next week, you have a chance to see a play for free in one of ten theaters across the region. Talk about starting out with a bang! From Palm Beach, all is silence. But here's what's happening in Miami-Dade and Broward counties! The top of the heap and the one to beat is the Actors' Playhouse production of 1776. Director David Arisco and his team assemble a huge number of men to bring us the Birth of our Nation, set to music. The musical 1776, a lavish yet revealingly human look at the men who signed the Declaration of Independence, suggests that contentious politicians eventually can get along -- though the path toward unanimity may be strewn with sacrificed ideas. ...Arisco, his artistic team and a powerhouse cast deliver a 1776 that fulfills its creators' intentions. ...future president John Adams (a puckish Gary Marachek) agitates for independence like some windbag party guest. 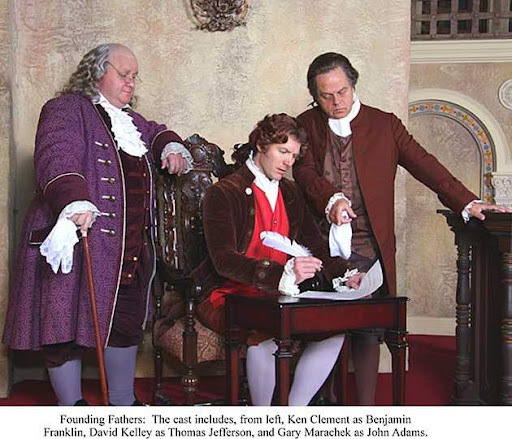 Ken Clement is a gout-plagued, lusty, witty Benjamin Franklin. Barry J. Tarallo displays a focused haughtiness as independence antagonist John Dickinson. Jim Ballard plays a self-adoring Richard Henry Lee, Shane R. Tanner the pro-slavery Edward Rutledge. David Jachin Kelley is a striking if reserved Thomas Jefferson. Colleen Amaya is a crystalline-voiced Abigail Adams, the woman behind the man who helped inspire the birth of a nation. And as Javier Ignacio sings a haunting lament for friends who died too young in war, 1776 feels piercingly timeless. Producers Barbara and Larry Stein, who took a huge gamble investing in a 26-member cast and the most sumptuous costumes from the rental house, match master director David Arisco's commitment. A second strength is the unexpected casting of rubber-faced comic actor Gary Marachek as the curmudgeonly firebrand John Adams. ... He's aided considerably by Ken Clement's wily, self-proclaimed sage Benjamin Franklin. The marvel is how a 1969 show written about an 18th century political convention resonates so deafeningly in 2008. Line after line echo our concerns about war, the true nature of patriotism and the difficulty of legislators balancing honor and compromise. John Hancock looks at the newly-minted Declaration and says, "How it will all end, God only knows." Once again, timeless theater captures the zeitgeist of today. Rounding out our 1776 coverage is Brandon K. Thorp for the Miami New Times. And true to form, Brandon brings a fresh point of view. ...They kept up the discussion, in whispers, well into the play. At first I was annoyed; then I was charmed. 1776 has everything to do with the moment. These days, we are all speaking the language of Samuel Adams and Benjamin Franklin, because we, like they, are living in historic times. Right now, on the Miracle Theater's stage, one month before what Joe Biden recently referred to as "the most important election of our lifetime," an enormous and enormously talented cast is dusting off America's most precious founding myth and imbuing it with a humanity, sense of humor, and sense of urgency that has gone missing from every reenactment I've ever seen. Ken Clement plays the serenely dour Ben Franklin like, well, Ben Franklin: perennially the smartest guy in the room and too wise to take his blessings too seriously. ...Colleen Amaya, ... though her appearances onstage are few and brief, they herald some of the play's most affecting moments. ...a perfectly enjoyable night at the theater, but it's more than that. In other reenactments of American myths — Johnny Tremain, The Last of the Mohicans, Pride & Prejudice — the talk of the characters often sounds weirdly anachronistic. But now, with our leaders preoccupied by grave issues of foreign policy and American self-definition, it's very much of the moment. The chatter doesn't sound distant. We — even the kids in the row behind me — are speaking their language again. 1776 runs through October 26, at the Miracle Theater in downtown Coral Gables. But let us not forget, 1776 was not the only play to open in Coral Gables last week; The Rant opened at the New Theatre. The Herald's Christine Dolen fit it into her schedule. As with almost all first productions, New Theatre's The Rant has strengths and flaws. Thanks to the National New Play Network, an organization of theaters that has pioneered the concept of the ''rolling'' world premiere, Case already has subsequent productions of the play lined up at Philadelphia's InterAct Theatre and the New Jersey Repertory Company. But New Theatre and director Ricky J. Martinez get the revealing first crack at the script. Case wants to make us wonder, wants us to assemble the pieces of a jigsaw puzzle without a proscribed final form. Mahnaz, as written by Case and played by Uribe, is weak, biased, fearful and ethically questionable. Strengthening her character and her motivations would help balance the play as a whole. But the others -- the coolly manipulative Waugh, the defensive Gaspard, the fierce DeGraff-Arenas -- deliver riveting performances as complicated people whose ways of looking at the same tragedy all somehow make sense. The New Theatre world premiere of Andrew Case's The Rant is a promising work in progress that needs more work to progress. Case's tale of an inquiry into a fatal police shooting of an autistic teenager contains lyrical writing and trenchant insights about the quixotic, doomed search for Truth with a capital T.
Though flawed, the script and the performances are undeniably moving and thought-provoking. Patrice DeGraff-Arenas' opening monologue of the anguished mother describing the killing in her statement to the investigator is electrifying. Reiss Gaspard delivers an equally anguished closing aria, a police officer's mea culpa that gets us as close to the truth as we're going to get. Mary Damiano covered The Rant for the Miami Sun-Post. The Rant is a cleverly crafted, relentless drama. It begins with a woman (Patrice DeGraff-Arenas) alone on stage, giving her side of the story of what happened the night her son was shot and killed by a police officer. It ends with one of the police officers (Reiss Gaspard) involved in the shooting alone on stage, giving his side. DeGraff-Arenas delivers a powerful performance as a grieving mother. Gaspard wears his role as a second skin. He’s believable and riveting, especially as The Rant moves toward its climax. Waugh offers a bit of much-needed comic relief and is dead-on as a reporter more interested in a front-page byline than the people behind his stories. The acting is truthful and engaging. Ricky Waugh seems to get better and better with each show I see him in. Reiss Gaspard, Patrice DeGraff-Arenas, and Pilar Uribe give performances that keep the audience on the edge of their seats. Director Ricky Martinez is on point with this challenging story. The Rant is a play that requires truth and realism from every point of view and New Theatre delivers it. The Rant runs through October 26th at the New Theatre's cozy Laguna Street theater in Coral Gables. Trouble is, both the script and director Genie Croft's production are unremarkable and unrevealing, though Baggs' story should have been rife with dramatic potential. Dolen evidently liked the performances - she mentions every cast member with a positive adjective; and singled out the sound design for its effectiveness in setting the period. Silent Heroes is, at different times, moving, powerful and poignant. For the most part, it avoids being too soapy, and presents realistic situations and reactions. Still, there are some problems. Sally Bondi and Jennifer Toohey are the standouts, and they get the juiciest roles and moments. Their characters provide an interesting counterpoint to one another: Bondi plays June, a woman who lost her first husband in Vietnam and is now awaiting news on hubby number two. Toohey plays Miranda, a recent college grad who believes in the changes taking place in the country regarding women’s lib and other counter-culture ideas. Both actresses fulfill the promise of the situation and their characters; Bondi is bound to get you misty-eyed while Toohey has never been better. Newcomer "DSP" of Theatre Row leads her "two fer one" review with Silent Heroes, and starts off by comparing the two experiences. While I've often chastized Brandon for wasting his gi-normous weekly page on a single play, it's not really fair to contrast two completely different plays by completely different companies with completely different resources in this manner. Perhaps, if both plays dealt with identical subject matter, or had some other compelling point of comparison, it might make sense. Each play deserves to be judged on its own merits, and not by a false relationship to each other. Silent Heroes feels more like a Lifetime movie of the week than a play. One almost expects Valerie Bertinelii to make a cameo appearance. One should expect more dramatic resonance in a play about six military wives gathered together to hear which one of their husbands will not be coming home. There are however some bright points in this cast that I hope will be better used by other theatres. Barbara Sloan is wonderful in the role of a strong willed Vietnam Veteran's wife. Jennifer Toohey (One of our areas most underrated actresses) is real and honest in her portrayal of a hippy chick with ideas of a better life. Silent Heroes runs through October 26 at the Women's Theatre Project in Fort Lauderdale. Makeover; a Contemporary Fairy Tale opens Saturday at the Cuillo Center. This is the same production that played at the Hollywood Playhouse last season. According to the producer, the Herald described this show as "a melodic gift." But the actual review followed that up with "His lyrics, however, leave much to be desired ... the script is even worse." Christine Dolen recommends an FAU production of Eurydice, a retelling of the Orpheus myth by McArthur Fellowship Winner Sarah Ruhl. Ruhl is sizing up to be one the great playwrights; Caldwell did one of her shows a while back, and Mosaic Theatre actually dropped a David Mamet play in order to present the regional premier ofRuhl's Dead Man's Cell Phone. Eurydice plays this Friday, Saturday and Sunday in Boca Raton. As tipped by Joel, The New World School of the Arts is opening Claire Booth Luce's The Women on Friday night. It's directed by Gail Garrisan, no stranger to South Florida Theatre patrons. Some Men at the Rising Action Theatre Company through November 2. Harry The Dirty Dog plays Saturday at the Broward Center for the Performing Arts. It's part of the Center's Family Fun series; lots of activities for the kids in the lobby. Crimes of the Heart opens, presented by the Miami Children's Theatre; this one is theater BY kids as much as FOR kids. "The Women" opens Friday night at New World School of the Arts (college division). I'll incorporate that into the "Openings" section this evening.